The "Diamond DLX" is three door machines in one because it can machine wood, steel and fiberglass doors. 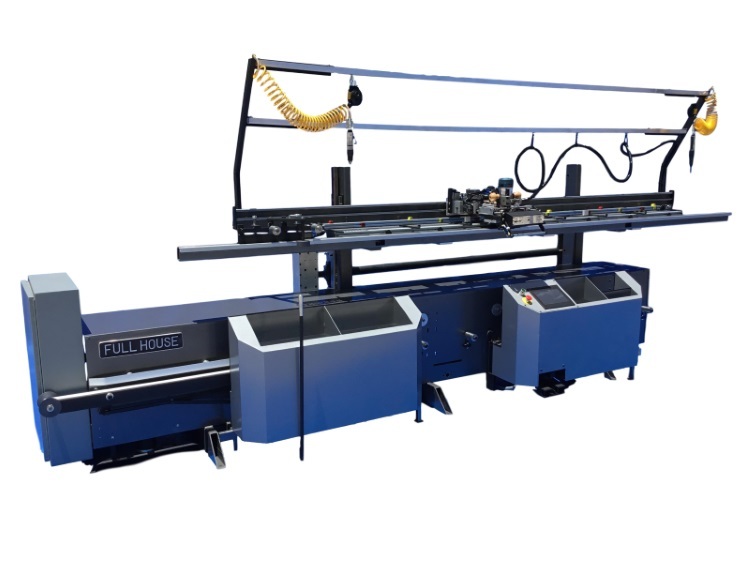 The ease of changeover and versatility makes this machine ideal for door shops that are producing house packages or custom door orders. The many features and options allow you to process all types of doors from standard interior doors to super high-end custom entrance doors. The superior design of the Diamond DLX also helps you build the highest quality door units on the market. 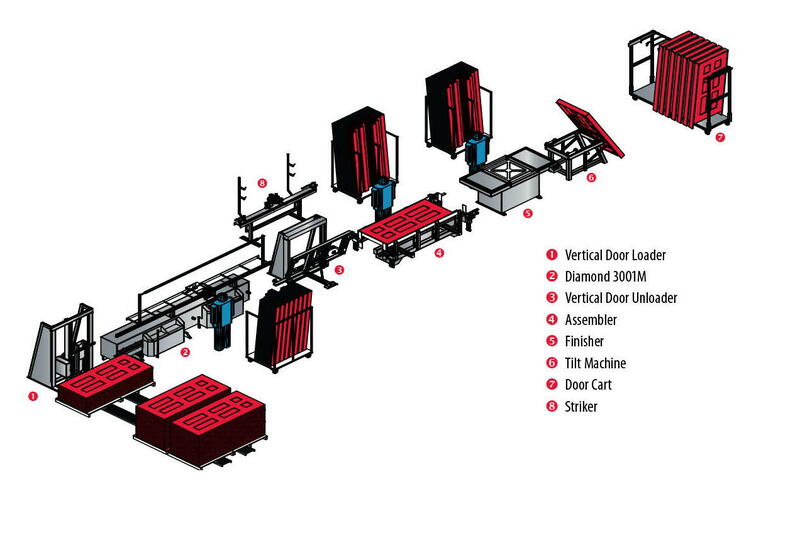 The Diamond DLX takes the tried and true vertical door machine to the next level. With a very user friendly touch screen display, the operator can quick change between all the features on this machine. Infinite width adjustment between 1'0 and 4'0 doors is hands free, precise, and takes just seconds. 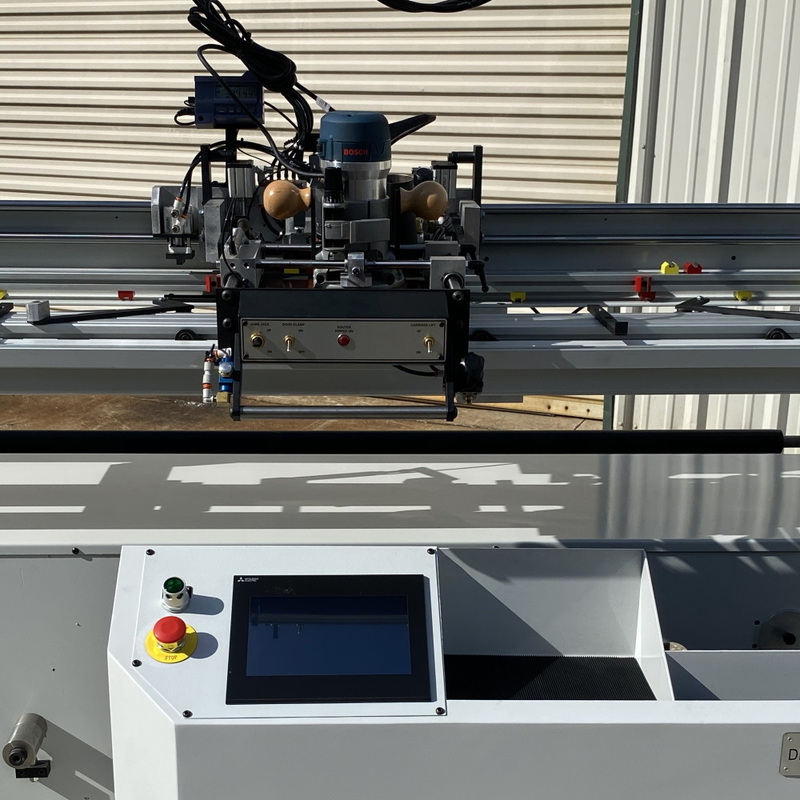 Automatic edge prep adds the speed and precision to the process, freeing up the operator to focus on the hinge routing and application process. Precision machining of wood, steel and fiberglass doors up to 4'0" x 9'0" x 2 1/4". Ideal for shops producing residential, commercial, architectural and fire-rated doors. 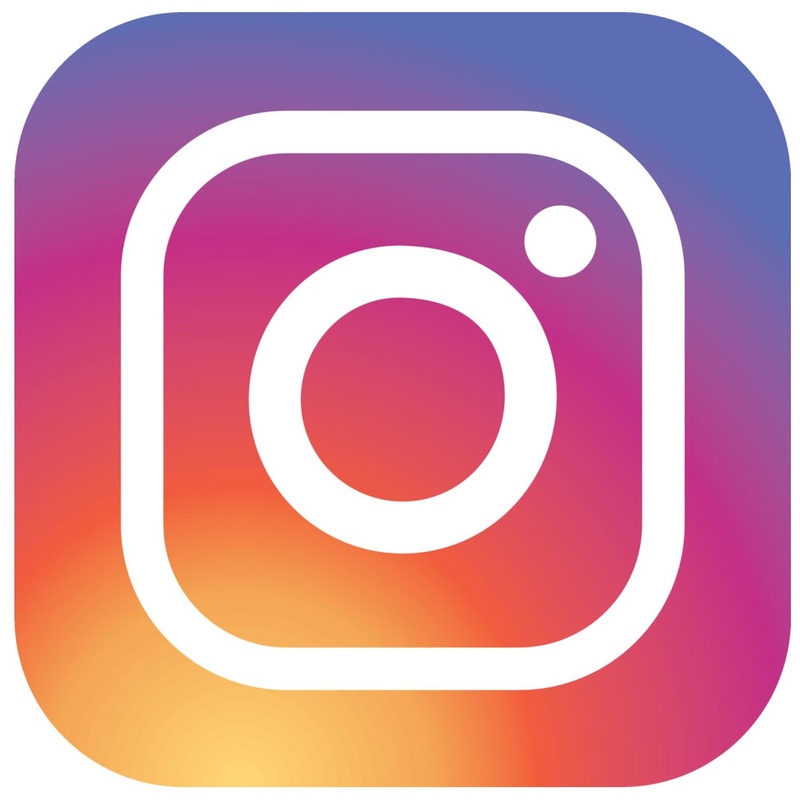 Automatically adjusts from interior to exterior doors. House jobs can be run with no changeover. 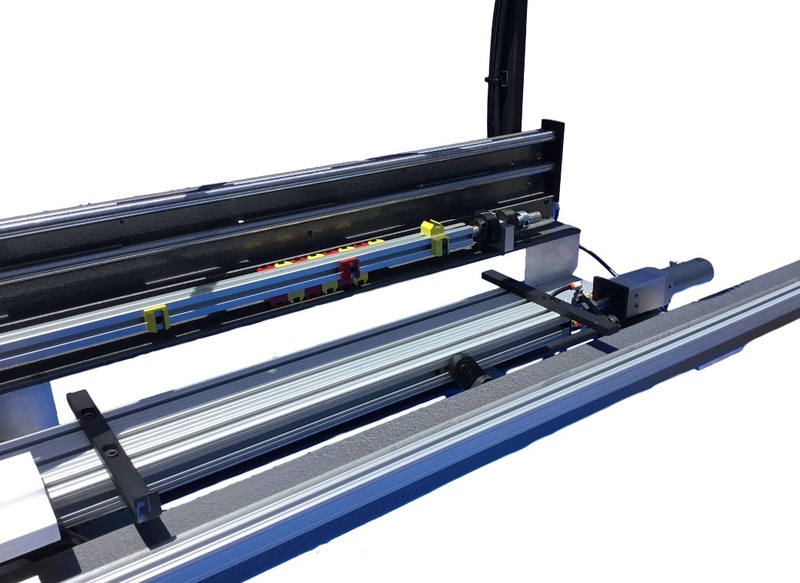 The Hinge Router carriage travels smoothly on a heavy duty Linear Rail System that provides accurate hinge placement. Rotating hinge location stop bar has 8 preset hinge patterns and the entire pattern can be changed in seconds. No need to invest in extra bars for each hinge pattern. 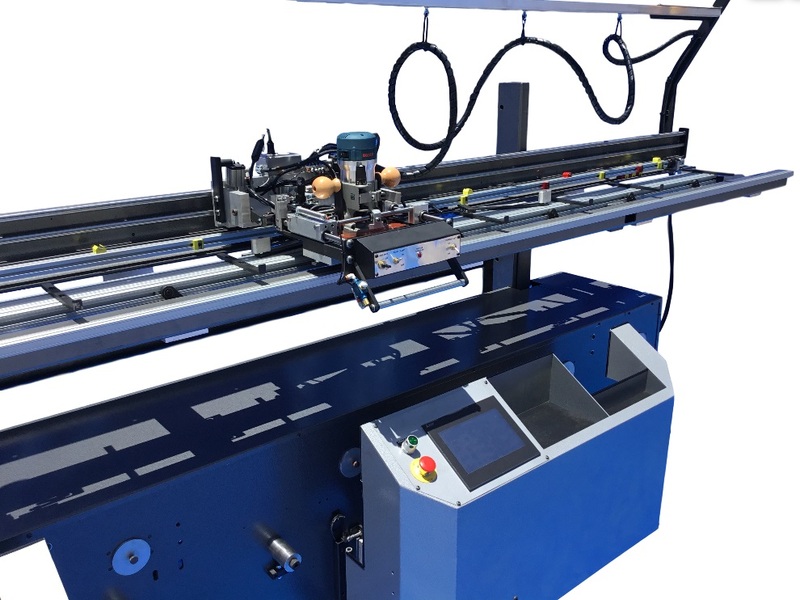 The Double Bevel Hinge Router Carriage will machine flush hinges on square edge or double beveled doors. Quick change door and jamb stops eliminate measuring when changing settings. Scaled front bar allows boring for custom lock heights. Quick changed templates are used to switch between any hinge size and radius. Templates are custom made to match your hinges and required backsets. The adjustment for jamb thickness is controlled by a switch on the front of the Hinge Router Carriage for instant adjustability. Servo driven Infinite width indexing allows all doors to be normally processed even if the door width is not standard. 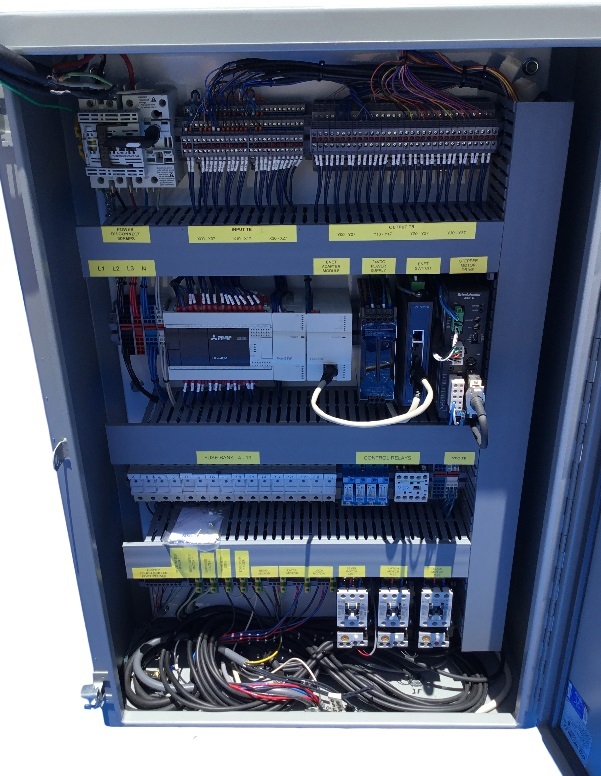 Changing lock bore backset from 2 3/8" to 2 3/4" is automatic by the touch of a button on the touch screen display. Full dust collection hook-ups are provided for the hinge router, beveler/sizer, and lock drilling module. Additional floor sweep has been added to help during shop cleanup. 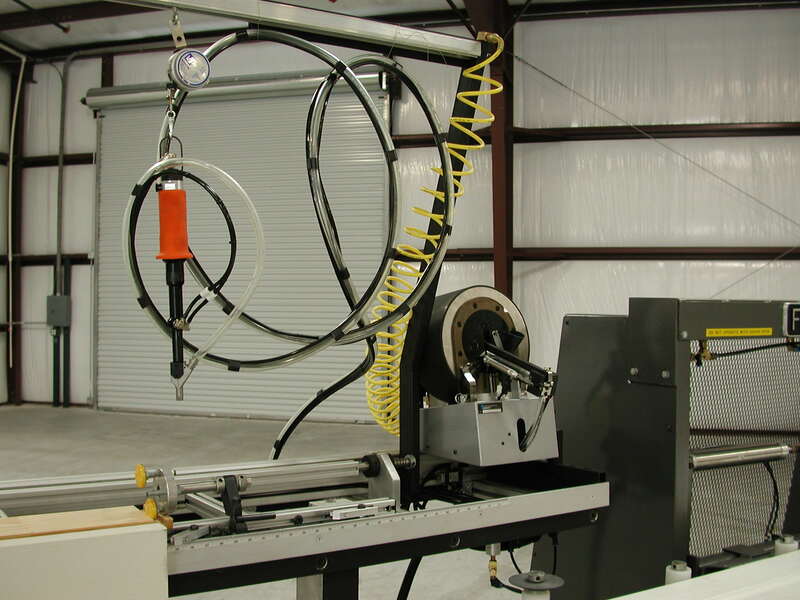 An overhead tool bar with tool balancer and air screwgun come standard for applying the hinges in the machine. These options can be purchased with your Diamond DLX or added later. Automatic Beveler/Sizer: (Now standard on DLX Model!) Power-fed 5HP beveler is used to size and bevel doors to the desired width. The cutter head rotates in the same direction as the door is moving for a perfect climb cut. Dual edge relief routers automatically adjust for different door thicknesses and ease the edge of the door for a smooth factory finish. Automatic Faceplate Routing: (Now standard on DLX Model!) Complete lock prep is automatic and occurs at the same time the operator is machining for hinges. The operator pushes a single foot pedal and the machine will bore for the lock, latch and mortise for the rectangular faceplate. This is all done without having to reposition the door and taking the chance of latch being misaligned. backup blocks and allows bits to be used longer. Second Lock Drill Module: Seperate two speed lock drill module is added to prep steel doors for locks and deadbolts. This second motor allows a lower R.P.M. for boring steel doors and a higher R.P.M. for boring fiberglass and wood doors. 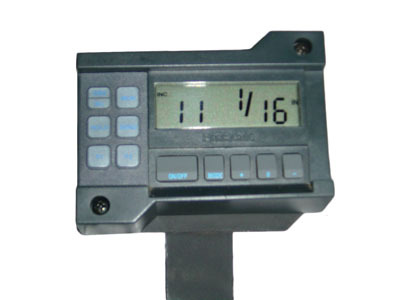 Digital Readout: This fractional display is located on the Hinge Router Carriage and is ideal for matching metal frames, special hinge locations or for replacement doors. Dust Vacuum System: An integrated 3HP dust collection system can be added. Quick Change Router Kit: Changing from 5/8" to 1/4" radius is accomplished in seconds using a second router kit. Air Pre-drill Kit: Pre-drill unit and a Vix bit is used to drill screw holes in the door and jamb to eliminate possible splitting. 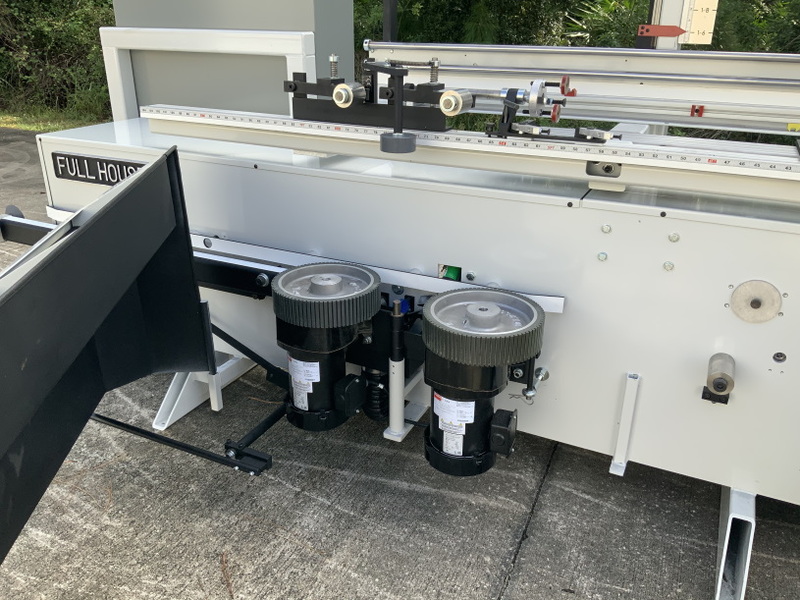 Inline Automatic Screwfeeder System: Automatically feeds hinge screws saving the operator a tremdenous amount of time. 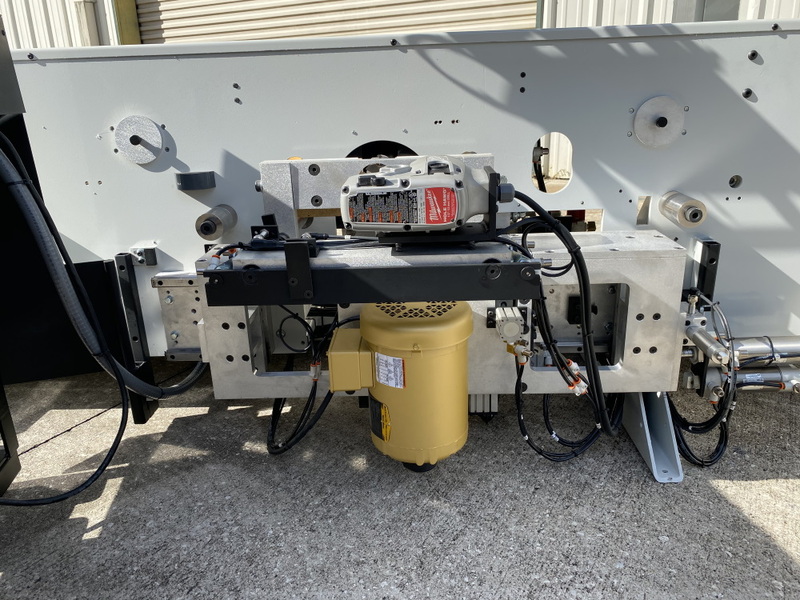 The screwfeeder is custom built to match your particular screw size and shape and is available with a quick change bowl for switching screw color. Width: Up to 10 1/2"
Thickness: Up to 1 1/2"
Hinge Sizes: 3 1/2", 4", 4 1/2",5"
Lock Backsets: 2 3/8", 2 3/4"
Faceplate Sizes: 1" x 2 1/4" & 1 1/8" x 2 1/4"
*The Diamond DLX's features, capabilities, specifications and electrical requirements can be fully customized to meet the needs of our domestic and international customers. 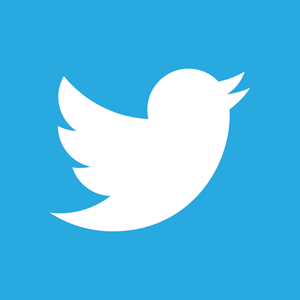 Please contact us for more available options.